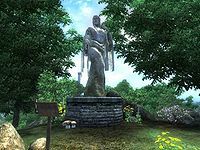 Shrine of Kynareth is an outdoor shrine to the Divine Kynareth in the Great Forest, west of the Imperial City (plugin-specific). It only becomes available once you have installed the Knights of the Nine official plug-in, and is located north of the Ayleid ruin Ceyatatar. According to its worshippers, the shrine has been built in the wilderness to honor Kynareth, who is believed to be the goddess of the heavens, the winds, the elements, and the unseen spirits of the air. The player is directed here during the quest to recover the Crusader's Relics, in order to retrieve the Divine's creation: the Boots of the Crusader. Three Flax plants near the statue of Kynareth, one more near a rock in front of the first row of pews. Three Monkshood plants are also around the statue, three more can be found on a rock nearby and seven more on some rocks behind the last row of pews. Two Summer Bolete near the altar of Kynareth, five more among some rocks behind the last row of pews. Esta página foi modificada pela última vez à(s) 20h00min de 3 de dezembro de 2013.